Artist Stacey Brass has completed a mural for the Fracture Outpatients clinic at the Royal Gwent Hospital. The project was initiated by the staff of the department - Gillian Watkins, Celia and Jackie - and there has been fundraising and donations made by consultants and other members of the team. Gill asked Gwent Arts in Health to manage the project and so Sarah Goodey (Arts Development Manager, Gwent Arts in Health & ABUHB) took the staff’s ideas forward and supported them in appointing Stacey. Stacey visited the department at busy times to meet patients and staff – young and old – to gather ideas about what the mural should look like. She drew up the designs and began painting. In a week, Stacey had finished and the change to the waiting area is remarkable. Sarah applied for support from ABUHB’s Charitable Funds on behalf of the ward and is very greatful for their support. 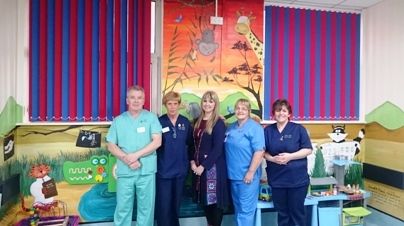 The Fracture Outpatients staff team at The Royal Gwent Hospital who raised money for the mural, and artist Stacey Brass.